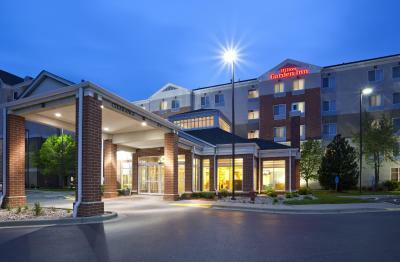 Lock in a great price for Hilton Garden Inn Minneapolis/Bloomington – rated 8.5 by recent guests! Pros: The bed was comfortable. Fiancé loved the fact corned beef hash was served for breakfast. I appreciated the option to have omelets, waffles, and pancakes made fresh for you. While there were signs of construction going on, which we were aware of, we were never disrupted by it. Easy check in; airport shuttle; free newspaper. Refrigerator and microwave in room. Everything, the staff was exceptional. Thank you! Everything-all was good. Friendly Staff, clean room, comfortable bed and pillows. The Lobby is welcoming and a nice area to gather-definitely will stay again-Thanks to All who made our stay Enjoyable!! Everything associated with the hotel was first class - especially the staff. We experienced a rather nasty blizzard that caused a shuttle to be incapacitated, but the wonderful young man at the front desk did everything in his power to help us and even provided complementary meals to us and reimbursed our travel expense so we could return to the hotel. We were delighted with how the adventure turned out! Good location and on site bar/restaurant helped during bad weather. Free shuttle to the Mall of America. One of the staff was helpful in locating a bag i thought i lost on the shuttle bus. Everything was good. Only bad thing was we asked for new towels and bedding while we went out shopping. We put our wet towels on the old sheets. Came back to the room amd the pile of towels and bedding where in the same spot. We only got towels and no new bedding. Great price. Very clean and quiet place. Free coffee. Hilton Garden Inn Minneapolis/Bloomington This rating is a reflection of how the property compares to the industry standard when it comes to price, facilities and services available. It's based on a self-evaluation by the property. Use this rating to help choose your stay! Minutes from St. Paul International Airport and the world-famous Mall of America shopping center, this hotel features spacious accommodations along with many modern conveniences, including free shuttle service. Situated close to Interstate 494, the Hilton Garden Inn Bloomington is an ideal location for exploring the surrounding area. With free shuttle service to both the airport and the Mall of America, guests can travel and explore stress-free. There are also a number of hiking trails, golf courses and casinos nearby. The suburban Bloomington Hilton Garden Inn provides guests with a variety of thoughtful amenities, including free high-speed internet access and in-room microwaves and refrigerators. Guests can also enjoy working out in the fitness center or shopping for gifts and snacks at the on-site convenience store. When would you like to stay at Hilton Garden Inn Minneapolis/Bloomington? Offering free WiFi and a flat-screen TV with premium film channels, this room includes a microwave, small refrigerator and tea and coffee-making facilities. This suite has a spa bath, air conditioning and microwave. House Rules Hilton Garden Inn Minneapolis/Bloomington takes special requests – add in the next step! Hilton Garden Inn Minneapolis&#47;Bloomington accepts these cards and reserves the right to temporarily hold an amount prior to arrival. Hilton Garden Inn Minneapolis/Bloomington accepts these cards and reserves the right to temporarily hold an amount prior to arrival. We were overbooked so we didn’t get the room we booked on the first night, when we came back in around noon to get moved the room still wasn’t available so we had to pack everything up in our car only to re-check in that night. For the most part the staff was friendly but they didn’t seem to be in a hurry to get our room fixed. Then on top of that we got charged $50 more than what booking.com said our final rate would be. Also, there were not enough parking spaces. The hot tub was nice, we didn’t eat there but there seemed to be many choices on the breakfast menu! Cons: The room service food was mediocre. The 12 count of wings my fiance ordered didn't even fill the plate, and the sauce tasted like "spiked ketchup" according to him. I ordered the charcuterie plate which had the usual fare, but I was dismayed at the ratio of "toppings" to crostini. I received 1.5 slices of salami, same for prosciutto, three decent slices of brie, 1/3 to 1/2 a contained of boursin cheese and 3 slices of a hard cheese, 3 mini sweet pickles, a 2oz souffle cup of honey, and a HUGE dollop of coarse mustard. The only thing I was offered to eat all that with was 3 slices of seasoned baguette which could have fit in my palm. Together. All three at once. I ended up having to use the three slices of hard cheese as makeshift crackers for the rest of the plate. I think by far the saddest part of the trip was the actual check-in process. I booked three rooms for myself and family through trivago some time ago with the option to pay at the hotel. We didnt think anything more on it until we got settled in and I realized the proce we paid at the desk was much higher than what was quoted on Trivago, which had included taxes and fees in their final cost. We were being overcharged by nearly $40 at the desk! My mother-in-law, fiance and I went down to the desk to inquire about this, and the gentleman there basically said we were being "precharged" for incidentals, as customers forget they order movies,etc, that is not cpvered by the initial hotel bill and the hotel loses money. I responded that i never had a hotel "precharge" me openly for services that I never use and not mention anythong aboutthos policy at thetime of booking or payment. To which I was told that most people SEE the extra charge when they pay at the desk and ask about it before they put the card in the machine and that after the trip I would be refunded the balance. I hated his smug attitude and it was a poor start to our family weekend. I’m a tea drinker, not a coffee drinker so would prefer electric kettle to boil water for cup of tea. The Keurig doesn’t cut it. Was extremely disappointed to be told I couldn’t do a park and fly because of construction and lack of parking and then get to hotel and find other people were able to do it! Very annoying and inconvenient. I requested a 5am wake up call and it came at 4:20 am. Bed could have been firmer. I didn't like how i got the jacuzzi suite for my wife's birthday and the heater next to the bed had a really bad smell. We had to turn it off due to a strong odor coming from the heater so we were very cold throughout the whole night. Clean and great service !! Facility was outdated. Many areas of the hotel should be repaired. Kelly at the front desk was awesome. Called for shuttle van from airport and learned our reservation got "lost." Kelly couldn't have been more accomodating and helpful. Told us to come to hotel and she would get us a room. Gave us great price. Shuttle van driver was great - funny guy! Room was spacious and clean. Very comfortable. Will definitely return. The spot light outside our window. The bed blanket had stain on it .No brush no tooth paste.Non of my request when I booked was addressed.I emailed asking if I could check in a bit early but got no response. Finally reassigned me a room upstairs.Should have asked for my preference and not just assign me room on the lowest floor.